Home / Gossips / Politics / ANAMBRA 2017 ELECTION: Who do you think will win? What are your opinions? How do you feel about the election? Comment and share!!! 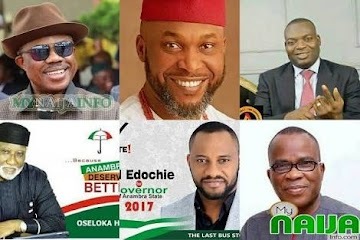 ANAMBRA 2017 ELECTION: Who do you think will win? What are your opinions? How do you feel about the election? Comment and share!!! Who do you think will win this election? What are you opinions concerning this election? Please kindly drop your comments in the comment section below.